Meridian Tapping, or Emotional Freedom Technique (EFT) is a simple technique that has been proven to reduce stress, decrease pain and reduce or eliminate many other symptoms of pain and/or illness. It includes many of the same techniques as acupuncture and concentrates on looking at the meridian system, which has been used in traditional Chinese medicine for thousands of years. Meridians are related to different parts of the body. Therapists who practice acupuncture use needles to stimulate the corresponding meridian, to provide relief of pain and other symptoms related to illness. EFT provides a stimulation of the meridians without using the needles by gentle meridian tapping. This therapy was discovered by an engineer from Stanford University, Gary Craig, who discovered that stimulation of the meridians by simple tapping, can provide pain relief. Just gently tapping with fingertips on the acupressure points can greatly relax the mind and body. Since his discovery, research has also shown that EFT can also reduce cortisol levels. EFT is simple and effective. Recognizing symptoms of the pain - this can be actual physical pain or any other emotional issue, like anger or grief. You will then assign a number to the issue, 1-10, with 10 be the greatest. Set up treatment- as you first begin the tapping you will acknowledge the issue, but also acknowledge acceptance of yourself by simple statements like “I’m OK”. Tapping acupressure points - you continue to tap on many of the other points, but also continue your affirmations of the pain/issue and your self acceptance. Resolution- this is the part of therapy that activates the left and right brain to integrate the change. Success with the therapy is dependent upon the clients ability to stay focused on symptoms and their release throughout the entire process. It is important to continue practicing EFT whenever thoughts, sensations or feelings re-appear. by Gary Craig, teaches more about the technique and how learning self-help therapies like EFT, can bring healing and peace to your life...without drugs! Simple tapping techniques requires no formal training, and has no medical side effects when used for stress, pain, or sickness relief. 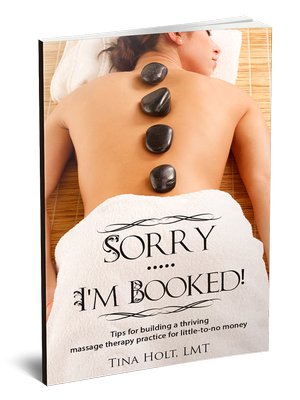 Learn how to build a thriving massage therapy practice....today!